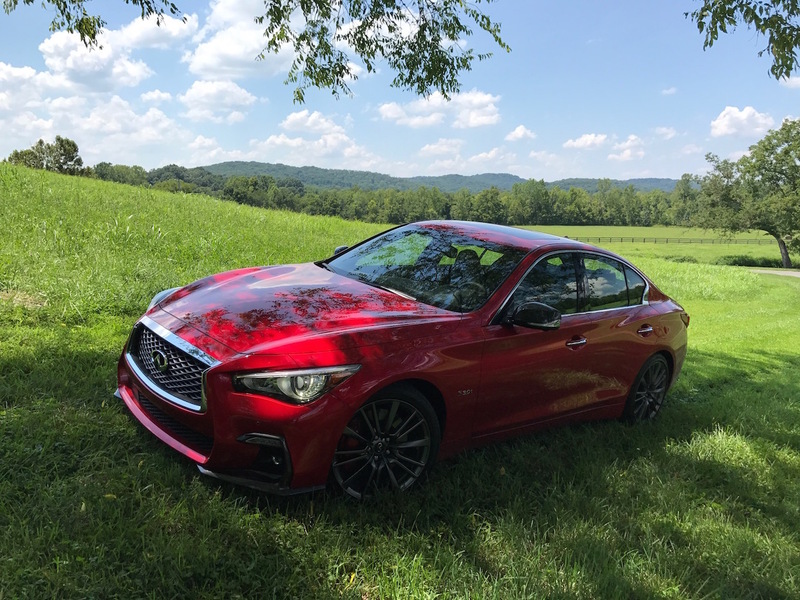 Nashville and the new Infiniti Q50 are designed for each other. Vegetarian TravelingMom explored “Music City” while listening to tunes on the premium Bose audio system. Leather seats, superb safety technology and refinements inside and out made the drive enjoyable, for Music City travel or further afield. 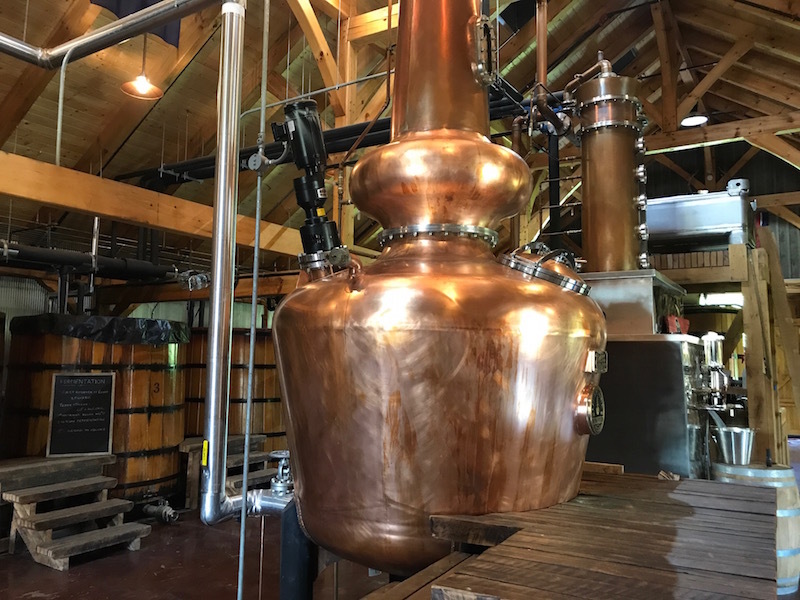 Nashville is well known for its live music scene, and most visitors to the city spend time at several music venues when they hit the town. 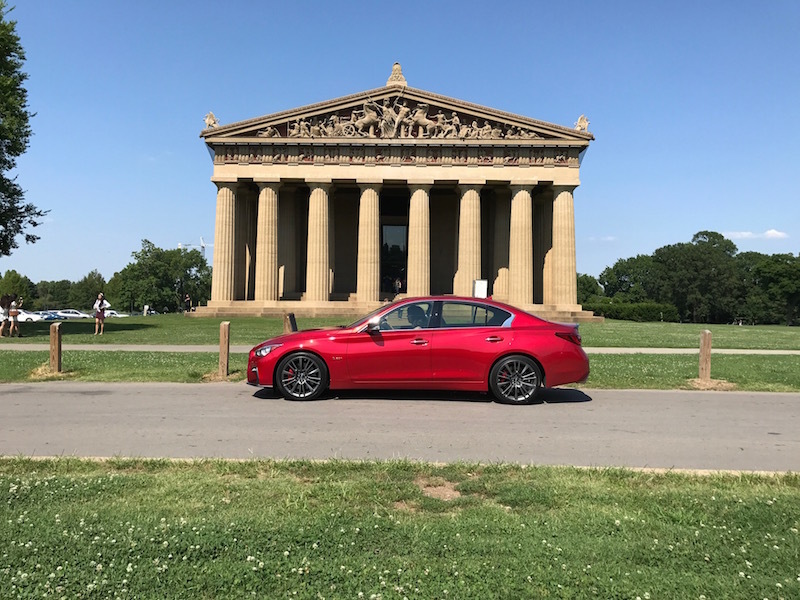 I was in Nashville to check out the new Infiniti Q50, which was perfectly in tune with the music scene. One of the new touches is a premium Bose audio system. The Q50 comes equipped with 16 speakers and live music sound when you get your favorite tunes cranking. Another refinement is a quiet cabin, so the sound of the road doesn’t impinge on your music enjoyment. 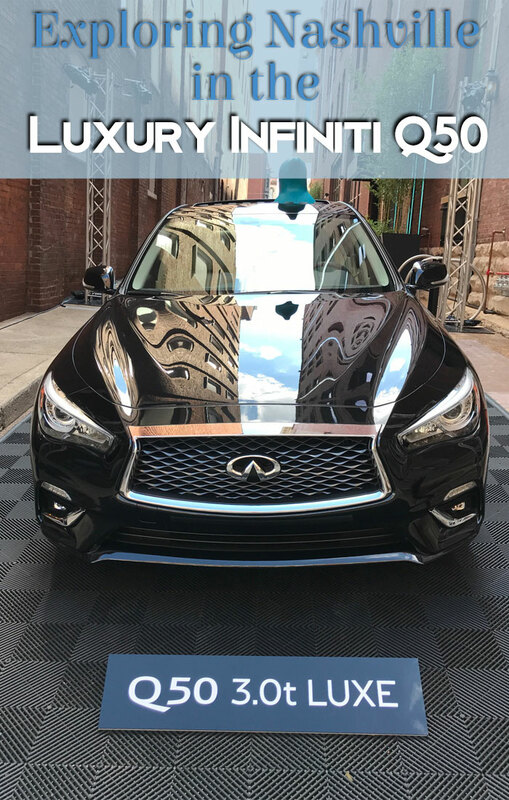 Not that you have to listen to music to get into the luxe feel of this car. We were given a bar of dark chocolate made with the whiskey at the hotel; these are sold at the gift shop, along with bottles to take home. The minute amount of whiskey in the chocolate makes it safe for kids to eat, but they probably wouldn’t like the deep, rich flavor. Better suited for kids is a Goo Goo cluster, made in Nashville. Milk chocolate surrounds marshmallow nougat, caramel, and roasted peanuts. Not quite as adult as the Leiper’s Fork bar, but delicious nonetheless. The heated leather seats make clean up a breeze, should you leave the chocolate in the sun. We had no need to use the heat; it was July in Nashville. But the above 90-degree weather didn’t bother us with the dual zone air conditioning. I tend to like the temperature warmer than my husband, so this is a great marriage saver. There is also a large sunroof and with the quiet cabin, we could enjoy the breeze and still chat. 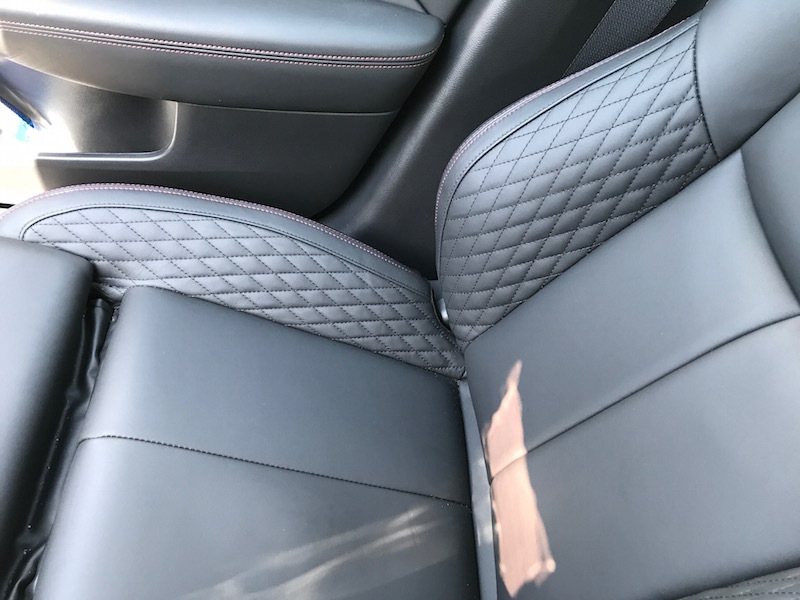 The quilting and contrast stitching on the seats are comfortable and make the car look luxurious on the inside. And the new grille and LED headlamps make the car look sportier. And the new grille and LED headlamps make the car look sportier. I stayed at a hotel just a couple of blocks from Broadway, lined with bars and music venues. This means the streets are filled with inebriated music fans, tour buses, pedi-cabs, horse-drawn carriages, and large pedal party buses. This makes the all safety technology on the Infiniti Q50 key. The car has predictive forward collision warning and back-up collision warning, active lane control, blind spot intervention, and lane departure warning. Fine tune these to be more or less engaged, or turn the system off. I liked the way the active lane control worked. It corrects you without overwhelming you, with a slight tug to put you on track. I liked the way the active lane control worked. It corrects you without overwhelming you, with a slight tug to put you on track. If you don’t like these safety controls, you can turn them off. I think they are quite helpful. but make sure you know how each functions. Blind spot intervention, for example, not only alerts the driver that someone is in her blind spot, it also sends out a signal to warn the driver of the other car. The reason there are hundreds of radio stations, countless television stations, youtube channels and even dating apps is that everyone has his or her own taste, or budget. Infiniti doesn’t believe in a one size fits all car, either. 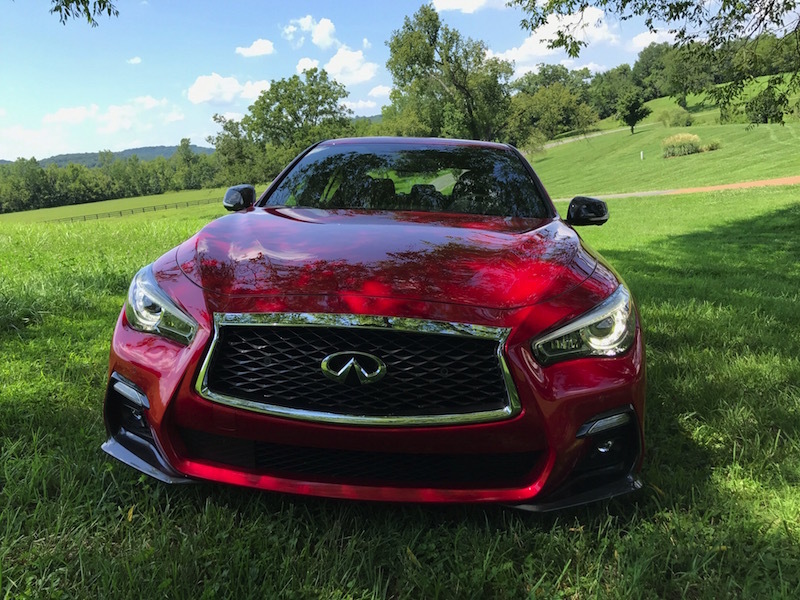 The Q50 comes in an almost dizzying set of choices. The entry level ‘pure’ comes in rear wheel drive or all wheel drive. It starts at $34,200. The enthusiast can choose the red sport edition, loaded with luxury and performance features. But at $51,000, it is far cheaper than other high-performance luxury sedans, so it offers good value. What is your favorite Music City Travel? 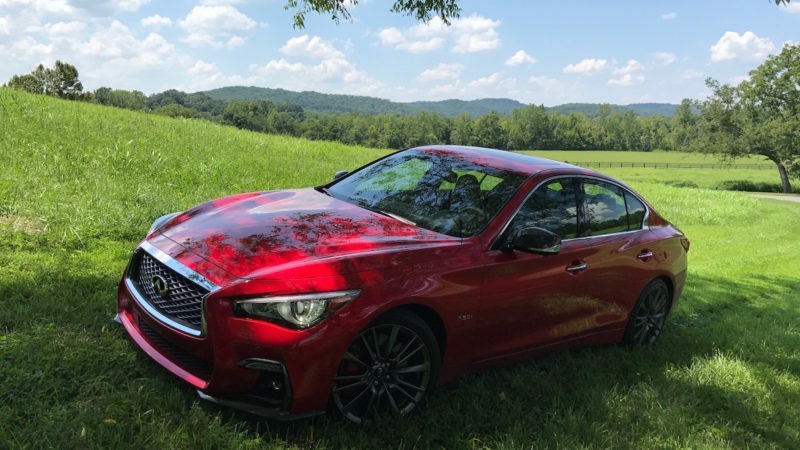 Which Infiniti Q50 would you like to take for a spin in Nashville?